I met Mary thru her Clip With Purpose Facebook page. Mary is the ultimate Operation Christmas Child shoebox packer! Mary & friends sorting thru a huge donation. 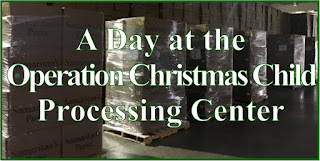 She crafts, she shops year round, she volunteers year round, she hosts a packing party for 2000+ boxes, she blogs--if it is OCC related she has done it or is doing it now. She has given me a desire to be more passionate about my packing. Even tho she is super busy, early in 2014 she posted about a desire to become more intimate with some of her shoeboxes. Crafting more items and making them special was one way she planned to accomplish her goal. This inspired me to turn my focus onto each box, each child, not the number of boxes I can pack. 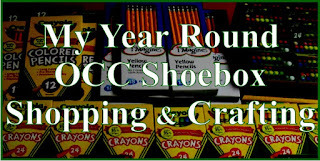 When I was questioning once if I should continue blogging, take on our church's OCC shoebox collection and other things I could add to my plate, Mary wisely said: "just because you can do it doesn't mean you should." I need to find the balance in all that I do. Mary's advice will continue to help me throughout my life and her passion for packing will continue to inspire. Mary introduced us to her late aunt when she was 95 and had already crocheted well over 1000 hats! Tho I never met Aunt Ida, not even online like the other ladies here, she has inspired me to Keep On (and to include a crocheted hat in each of my boxes). Keep on when discouragements come, keep on when I encounter physically draining days, keep on when there seems to be more need than money. Keep on and one day I will be able to look back and know that thousands of children have felt loved because I, too, didn't give up. You can find Aunt Ida's hat pattern on Joy With Purpose. to match Aunt Ida's Hat. Pam has been packing shoe boxes for a few years now and loves to crochet. She made thousands of change purses for their NE Pennsylvania packing party. She wondered if she could tackle crocheted stuffed animals. 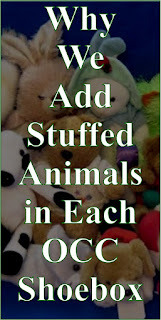 Several of her online shoe box packing friends assured her she could and she took the plunge and has done a bang up job of crocheting well over 500 stuffed animals. Thru Pam's example I have learned to not be afraid to try something new. I have also learned to find my niche in this huge shoe box packing world. Pam is not concerned with having to pack boxes for each of her critters to travel in, she is content to be the "Unofficial OCC Critter Creator" and to donate them to the packing party. Her example reminds me that I can find my own specialty when it comes to Operation Christmas Child shoebox packing--I am still searching for what that is. You can read Pam's guest post here: Adding A Little Love with a Personal Touch. My most "distant" online shoe box packing friend and inspiration is Jo from the UK. I met her thru her Facebook page Crafting for Shoeboxes where she has created a community of shoebox packing crafters. Her montage is that "Happiness is Handmade" and she has inspired me thru her passion of adding a personal touch to shoe box gifts by adding handmade items. The amazing quality of her work has also inspired me to do my best when crafting for shoe boxes. This year I hope to branch out and make even more handmade items for my boxes. Without Jo's inspiration I would probably not think to craft so many items. The many followers of her page who share their crafting projects continue to spark ideas of things I'd like to craft for my shoe boxes. You can meet Jo right here on Simply Shoeboxes in this earlier post: Happiness Is Handmade. My daughters practically grew up packing shoe boxes. 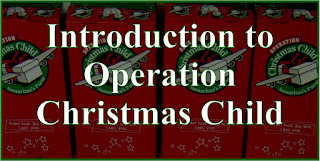 We began the first year Operation Christmas Child collected shoeboxes. We lived in "shoe box country" and heard about the drive to collect gift filled shoe boxes on WMIT, a Billy Graham radio station. We often think as parents we teach our children many things, but often it is they who teach us. As I have watched my daughter Sarah [from Sarah's Scribblings & Simply CVS] pack her shoe boxes over the years she has taught me what it is to put your heart into your box. Tho she packs many boxes each year she puts the time and thought into each one as if it were the only one. Each is made special in some way and she is very creative with what she includes. She would never skimp on wrapping the box and makes sure there are no empty gaps -- things I have been know to do in my quest to pack many. Another way she makes them personal is in the letter she includes. 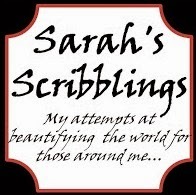 I am happy to write one letter and print it off and include it in each box--not Sarah. A handwritten personal note is found in each of her boxes. 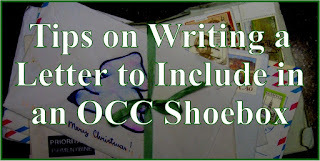 She wrote a guest post here about writing letters: Tips on Writing A Letter to Include in Your Operation Christmas Child Shoebox. I plan to write my letters throughout the year so I can be more personal and not feel rushed when November comes around. I am sure my daughters will continue to teach me as the years go by and I look forward to the lessons. 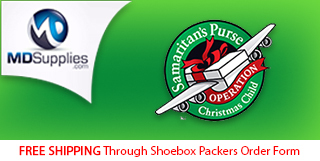 UPDATED 2017: Sarah took over this Simply Shoeboxes site and Facebook page a couple years ago. Stephanie is a year round Operation Christmas Child shoebox volunteer and runs the Shoebox Shoppers Facebook page where she shares shopping deals. 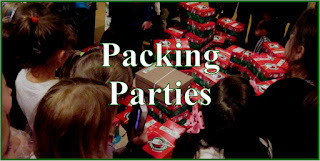 She is involved in many different aspects of packing shoeboxes and shares much of her journey on the Facebook page, including her church's packing party. With all of her many activities she still finds time to fill hundreds of shoeboxes personally. She is always encouraging her followers on Facebook that each box is important, whether we pack one or one hundred, but also encourages us to pack one more if we can. I have really learned from her to not stop with one shoebox packed....pack just one more. 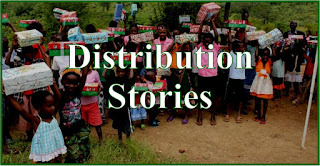 You can read about Stephanie's Operation Christmas Child distribution trip to Tanzania and her guest post A Day at the Operation Christmas Child Processing Center post here on Simply Shoeboxes. 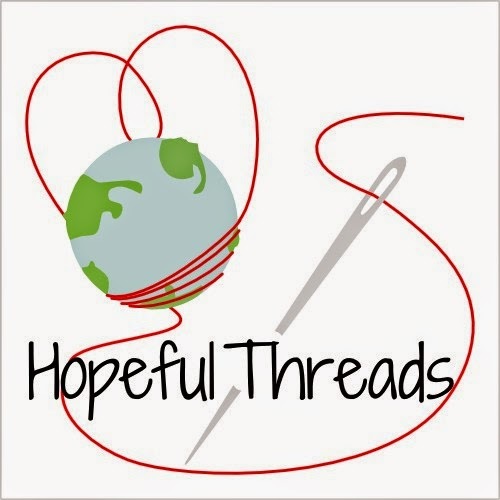 Kristy began blogging at Hopeful Threads encouraging her readers to join her in monthly charity sewing projects. 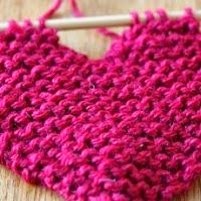 She eventually transitioned to quarterly projects and this year has another plan for her charity sewing -- sewing from her heart for the projects that mean the most to her and sharing her journey with her readers. I met her thru her blog and her passion for helping others has been a breath of fresh air. Kristy has taught me to use quality products when crafting for charity. But more importantly she has inspired me to craft items as if they were gifts for members of my own family. 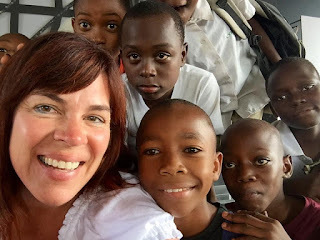 Kristy is the mother of six and sews for all of them as well as for kids around the world--from kids in foster care in TN to babies in China; and everything she sews is made with love and care no matter who it is for. She is a constant reminder to pack my boxes as if they were for my own child. Kathy from Life Inside the Box ~ Don't Be Afraid to "Go For It!" Kathy began with packing three shoe boxes in 1995. The next year she packed 5, then 40 then 125. By 2008 she was packing over 7,000. I'm not sure what year she started her packing parties but this past year she hosted one of her mega packing parties and they packed over 22,000 boxes in one day. Even tho she buys in bulk for some items, she still shops clearance deals and she still packs personal boxes at home -- lots of them! Kathy has inspired me not to be afraid to go where I find myself on my own shoe box journey. 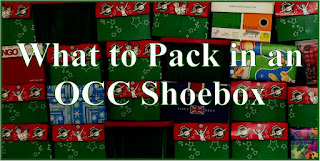 You can follow along her shoe box packing adventure at her blog Life Inside The Box. JR Frugal Mom and I "met" online several years ago when we entered the blogging world. JR blogs at Frugality Is Free about her frugal lifestyle. She used to have a slogan on her blog that said something like "Living like a Queen frugally." She doesn't skimp on quality while living frugally. 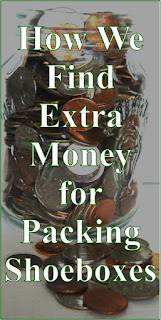 This has inspired me to try to aim for higher quality items while packing my boxes frugally. Two ways she has helped me do this was by introducing me to the concept of earning free gift cards from online activities from sites like Swagbucks and to enter blog giveaways. 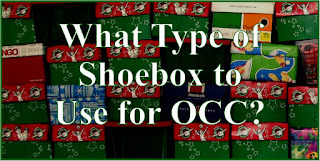 I have earned hundreds of dollars in gift cards from online activities over the years and hundreds of dollars in gift cards and gifts for my OCC shoeboxes from blog giveaway wins. From following along at Frugality Is Free I have also learned how to shop more frugally and have been alerted to some great deals I have been able to get in on. One of the things I learned was about using a dollar off total dollar amount coupon AND a percent off coupon on one Kohl's order. This has saved me quite a bit while spending a $250 Kohl's card I won recently. So thanks to JR Frugalmom I have been able to pack more boxes with higher quality items. 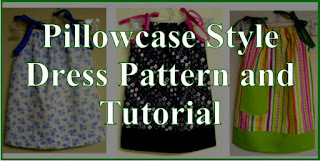 I have shared before how I was Googling for pillowcase dress patterns when I stumbled upon the blog Sew Delightful written by Suzanne. At the time Suzanne was the Washington State representative of Dress A Girl Around the World. When I began following her blog not only did it inspire me to begin sewing dresses for Dress A Girl, but Suzanne inspired me with her dresses. She made the most beautiful dresses. Her goal in 2013 was to sew 350 dresses which se accomplished. She even took her machine on vacations. She showed me what could be accomplished when goals are set. 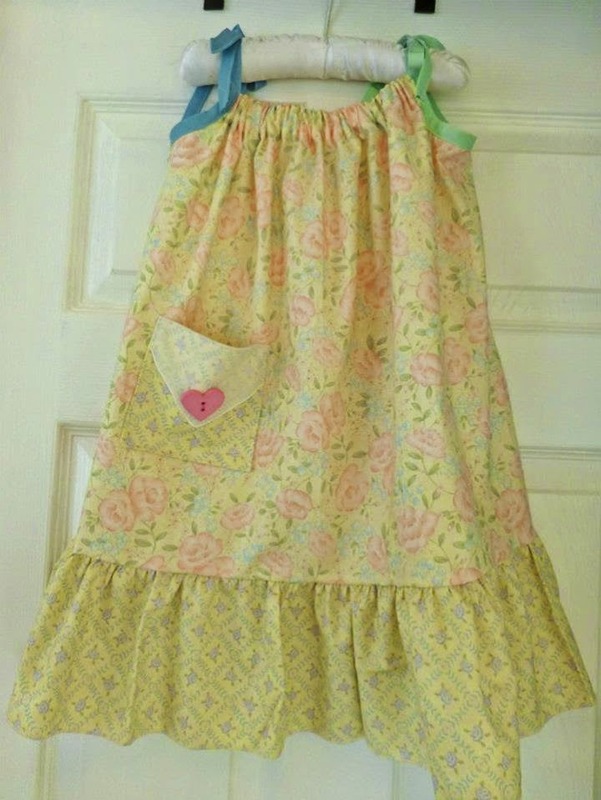 But the inspiration I take from her is to make the dresses beautiful -- even when sewing in quantitiy. She adds ruffles to the bottom (which I don't do because of the extra room it takes up in the shoeboxes) and always adds a pocket -- and not just a plain pocket, but a special pocket. She has inspired me to take my time and make my dresses, and my boxes, special. Many women who stop by and leave comments here on the blog or on Simply Shoeboxes' Facebook page continue to inspire me daily. Each time I read of what they are packing or crafting or "hear" their excitement of a great deal they find or share their goals or ideas or tell me about an extra special something they have for one of their Operation Christmas Child shoeboxes I am inspired to keep on keeping on. Thanks to all of you for helping me to develop my shoebox packing style and for keeping the passion alive. Who or what has inspired you in your packing? What an amazing group of women, even I feel inspired now. You too have been a huge inspiration to me in so many ways over the years - and you certainly still are. Thank you, JR, for your kind comment and for your inspiration. It is an amazing group of women. Wow what an inspiring group of people and thank you for including me!! You are so kind and generous!! Thank you for living an inspiring life, Suzanne. My dresses have certainly been inspired by your example. Amazing women, must say quite a few inspire me too, including you! Between dresses for Dress A Girl and goodies for the boxes including Aunt Ida's hat (my favorite goto hat), crafting is no longer just my therapy, it is a gift I love giving!! Hi, Chelle! Aren't they inspirational though?? How wonderful you have found so many ways to use your crafting for giving -- it is such a joy. Thanks for stopping by! They are lovely, aren't they? Thanks for your inspiration. I have been packing for 19 yrs. In the last few years, I have been making items. I look for material in thrift shops and people from church have given material. I make a simple skirt, tee shirt and hair piece to match. I am a year round OCC volunteer and will be attending my first OCC Connect Conference this year. The most powerful gift we have is prayer!!! I love shoeboxes. They are my passion. 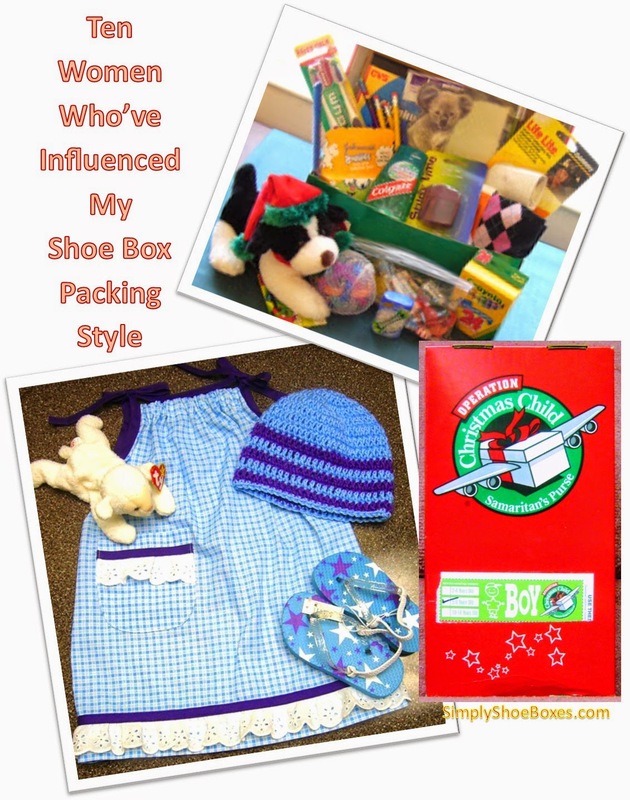 Thank you, Karen, for sharing your Shoe Box story! We, too, have been packing for many years (since year one actually) but only in the last couple have I crafted for them...missed out on so many opportunities. I have started making skirts, too, but I buy my shirts -- but you have inspired me into looking into making them. Thanks again for sharing your passion with us. Happy Packing! Wow! I definitely need to step up my game! Thanks for all the inspiration and ideas! You are welcome, Cyndee. Thanks for stopping by. Thanks so much for including me in your list! I truly feel honored to have made it into your top 10! I am really inspired to craft for my boxes!! I always plan to but this is my yr! My hubby helped me clean up & clear out SO now I can. dream, imagine & find things needed!! I am also collecting things all yr now. I am inspired to tally in a joutnal, sort and label bins. OCC makes me happy!! Sounds like you are ready to go! 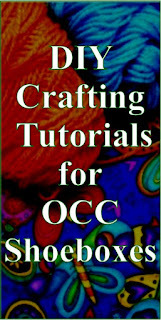 And since OCC makes you happy you will have a wonderful year! 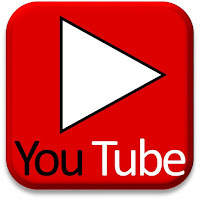 Stop by now and again and let me know how it is going. Happy Packing. Thanks, Cheryl for inspiring me! I learned about CVS from a local coupon expert and think I learned about Clip With Purpose from you. I have participated in OCC for a long time after reading about it in Guideposts for Children magazine with my son who is not 28. My shoebox donations have increased with your help and inspiration though! Thank you so much, Anonymous, for letting me know that you have found inspiration and help packing your shoe boxes from what I've posted. It is an encouragement to keep sharing my journey. You have been packing a long time! My girls are now grown, too, and we packed when they are young. I don't think we will ever tire of it. Thanks for stopping by and for commenting.